My purpose in writing this book is several-fold. My primary aim is to propose a workable first step in the creation of global decision-making institutions that can effectively and efficiently attend to the urgent and immediate needs of the 21st Century. I hope to demonstrate that it is possible to build a global system of governance that serves all the peoples of the world and that is founded upon the principles of federalism. I believe that the best approach is to start in a narrow sphere of international endeavor and then to build outward, gradually and methodically expanding into broader spheres as success inspires confidence. 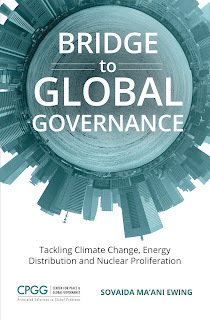 As a starting point, I propose breaking the logjam caused in our global life by the complex of three seemingly intractable problems: global warming, inequitable distribution of energy, and nuclear proliferation. Success in this urgent but narrow sphere of international endeavor would bring immediate benefits to all and thereby engender hope, free us from the grip of paralyzed will, and inspire confidence to expand the spheres in which we apply this methodology, covering ever-widening areas of collective need. Another purpose of this book is to demonstrate the power of even a handful of individuals, particularly those in positions of leadership motivated by only the best interests of humanity rather than self-interest and exhibiting certain sterling qualities like freedom from prejudice, to bring about organic and far-reaching changes in the structure of our global governance institutions that in turn foster peace, prosperity and stability in our global society. In a world where the rule of strongmen seems to be once again on the rise, where leaders unabashedly stir up the ugliest and most divisive of human emotions like xenophobia, racism, and sexism to gain and maintain their grip on power, and where the forces of nationalism appear to be gaining ascendancy resulting in the increasing fragmentation of human society, I believe it is essential that we remind ourselves of a better world which could be ours if we only bring ourselves to demand leaders with qualities that inspire trust and engender unity. Lastly, but by no means of least importance, I aim to illustrate the power of consciously and deliberately weaving a set of universally agreed, global ethics into the very structures of our global governance institutions. It is not sufficient for our leaders to possess ennobling qualities. In addition, the very composition, voting structures, and processes that govern our institutions must also embody principles of oneness, equity, and uncompromising focus on the collective good to inspire trust and confidence in the governed and guard against the corrosive forces of self-interest and corruption. The model I propose is based on the remarkably successful European Coal and Steel Community (ECSC) adopted after the Second World War to enable the recently warring countries to rebuild their devastated economies and national polities despite critical shortages of coal and steel without falling into the same traps that doomed the same countries after World War One. As I will explore in depth, we can derive much inspiration and many lessons from the ECSC about how to solve the complex, entrenched problems facing us today, in particular the three-fold complex of global warming, inequitable distribution of energy, and nuclear proliferation. The ECSC had many strengths from which we can learn, ranging from the way it came into being, to its composition, funding, powers, and guiding principles, and most importantly to its role in bringing a lasting peace to Europe. The successes of the ECSC inspired confidence among its member nations to deepen and expand their cooperation to encompass additional domains of economic, security, and legal policy in what we know today as the European Union. 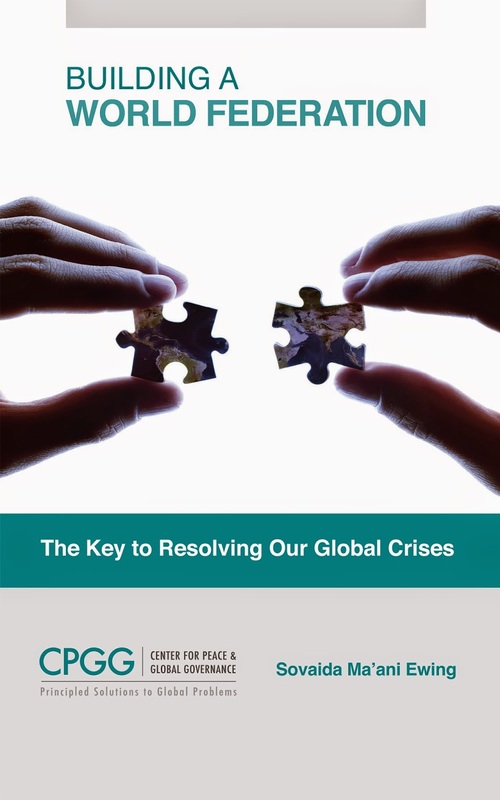 Although the ECSC also suffered from certain weaknesses, these are no less instructive as we strive to shape global governance institutions that are fit for purpose for the 21st Century and beyond. In this book I hope to offer a useful model for action. Although the argument rests on textual resources and analyses, footnotes would obstruct what I hope is a natural flow of ideas. Those who wish to dive deeper, however, will find these sources in a bibliography at the end of the book, broken down by chapter. Get your copy today at www.amazon.com, www.barnesandnoble.com, or www.kobo.com. Although obvious, it bears repeating and reflecting on the fact that we live in a world that is deeply interconnected and interdependent. The strides we humans have made in communications, transportation, trade and finance, have brought to the point in which our destinies are intimately linked together. Our interconnectedness has, indeed, made of us a single organism. While there are many benefits to be derived from such an interlinking of destinies, there are also inevitable downsides. The greatest downside is that we are increasingly susceptible to systemic, collective risks. We do not have to look far to identify some of these systemic risks. Chief amongst them are climate change and nuclear proliferation, with all the dangers they pose to our very survival. These risks also include terrorism, migration, global financial crises, genocide and other egregious human rights abuses, to name a few more. The collective and systemic nature of these grave risks and dangers demands a collectively agreed-upon response. To arrive at such a collective response, we must consult, cooperate and act together. And yet, we find ourselves in this bizarre position of lacking the very collective decision-making and enforcement institutions that our world so clearly and desperately needs. Our systems of global governance are extremely primitive. Designed as they were to address the needs of a bygone time, they are astoundingly unfit to address the problems of the 21st century and beyond. One of the great thinkers of our time, Kishore Mahbubani, has summed up our current state of affairs perfectly. He likens humanity to a ship carrying 7 billion people. The ship is divided into 193 cabins. While each cabin has its own captain and crew, the ship as a whole lacks both a captain and crew. It is consequently adrift on the seas, without anyone to guide it therefore finds itself at the mercy of gales and storms. So, what can we do? Before we begin, we need to get clear about one thing: human institutions, policies and laws are there to serve our well-being and happiness. It makes no sense for us to sacrifice ourselves to uphold any of these that no longer serves our purpose. So, if what we really need is a collective decision-making institution to determine determine things like the the kinds of energy we can use going forward to ameliorate global warming; or the means of ensuring that all nations have equitable access to clean energy to meet their needs and to clean water and sufficient food; or effective ways to regulate arms production and put an end to the proliferation of nuclear weapons, and if our current institutions do not have the capacity to do what is needed, then isn't it time to think about creating a World Parliament that can do these things? 1. Ensuring that the World Parliament has the requisite power and authority to pass binding laws in certain narrow spheres in which all nations and peoples have a collective interest. These spheres, as mentioned above, include but are not limited to, climate change, the proliferation of nuclear and other weapons of mass destruction, and egregious human rights abuses including genocide. In other words, we want to give this Parliament the kinds of powers that the current General Assembly of the United Nations (UNGA) lacks. While UNGA provides a wonderful forum for appointed representatives of governments to come together for periodic consultation and discussion, it simply lacks the authority to pass laws that are binding on the nations of the world, because the UN Charter never gave it such authority. 2. Ensuring that the World Parliament we establish with the requisite authority to pass laws that bind us all in certain narrow areas of collective interest, properly and adequately represents all the peoples of the world and that there is no democratic deficit. To achieve this end, the members of this Parliament should be directly elected: The citizens of each nation should be able to elect their representatives to such a Parliament in proportion to the size of their population. This election can, and ideally ought to be, confirmed by each government. After all, many of us elect representatives to our local councils, state legislatures and national legislatures. Given that we have now evolved into a global community, why can we not also elect our members to an international legislature? Over the years, there have been some proposals regarding interim steps we can take towards the establishment of such a Parliament. One such proposal made in 2015 is that we begin by creating a UN Parliamentary Network to serve as an advisory body to UNGA. The idea is that this Network would bring together parliamentarians from national governments to New York at least once a year, in September, to share with UNGA grassroots concerns (including those of the private sector and civil society) about matters that affect global security and justice worldwide, and to inject fresh ideas into the debates at UNGA. The problem with this suggestion is that it does not address the fundamental deficit of binding decision-making ability at the UN. In other words, adding a Network that is to function essentially as an advisory body to an existing body (UNGA) that is already toothless in terms of its ability to pass binding legislation for the collective good, does not move the ball forward. On the contrary, it could be viewed as merely adding another cumbersome layer to an already-bloated UN bureaucracy. The Network if composed of parliamentarians that have been elected in their nation-states, as currently proposed, does, however, go some way towards addressing the problem of democratic deficiency. Although it would be even better if its members were directly elected by their citizens. As this proposal evolves, it is important to ensure that the members of the Network are truly in touch with the various grassroots communities in their countries and are able to convey their true concerns and sentiments and are not relying solely or mainly on civil society and the private sector for their information. Although civil society has an important role to play in international life, the truth is that NGOs are unelected and self-appointed and tend to function more like lobbying organizations. They generally do not represent the majority or even any minority of people. Yet, by effectively networking and mobilizing their members they can wield a disproportionate influence on decision-making and shaping of global politics. Moreover, NGOs have their own agenda and sources of funding and their nature, impact and interests have become almost impossible to measure according to scholars. This should lead us to ask the important question: why should they have the ear of international decision-makers when the citizenry do not? A different proposal for an interim step to be taken towards establishing a World Parliament, one that has garnered some support, is that we establish a World Parliamentary Assembly. Like the Parliamentary Network, the idea again is that this Assembly serve as a consultative body to the UNGA. The proposed logic is that while the UNGA represents governments (its members being the appointees of member governments), this Assembly would form a second chamber that represents the voice of the people. The argument is that such an Assembly would be similar to the Common Assembly that served the European Communities (the European Economic Community, and its two sister communities, the European Coal and Steel Community and the European Atomic Energy Community). However, we should stop and remember that the situation in Europe was very different to the state of play of international institutions today. The three European communities already had a very strong legislative and executive arm (the Council of Ministers and Commission respectively) with the authority to propose, pass and enforce laws that bound their member states. Under those circumstances it made sense to inject the voice of the citizens of the members states into the decision-making process by creating a Parliamentary Assembly representing the people, and giving it a consultative role that would evolve over time to encompass co-decision-making powers. By contrast, as of today, we have no institutions at the international level that resemble either the European Council of Ministers and the European Commission in their authority to propose and pass binding laws, therefore begging the question of the value to be gained by adding yet another purely consultative body to the mix of of institutions that lack decision-making powers. Although the proposal for a Parliamentary Assembly does not address the binding decision-making deficit, it does seem to adequately address the democratic deficit. The idea being put forward is that the Assembly initially be made up of national parliamentarians or representatives that are directly elected by the citizens of member countries. While this proposal addresses the problem of the democratic deficit at UNGA by providing for direct election, we are still left with the question of how adding a consultative body to UNGA -- a body that lack authority to pass binding international legislation -- will help us arrive at the collective solutions we need, in the form of binding laws, to address our gravest global challenges. This brings us back full circle to the proposal for a World Parliament made at the beginning of this article, a proposal that addresses both the binding decision-making deficit as well as the democratic deficit. Is it not worth focussing our energies on a global plan of education to raise awareness amongst the citizens of all nations of the need for and feasibility of creating such a World Parliament whose members are directly elected by the citizens of all 193 nations, with authority to pass binding international legislation in at least one or two narrow spheres of collective interest? It is worth the experiment: As time goes on and this body develops capacity, confidence and wins the trust of the international community, we can consider adding to its powers in further areas of collective interest that require swift and effective collective decision-making. We live in amazing times! Thanks to incredible advances in communications and transportation, trade, finance and technology, our world has become interconnected and interdependent in ways that are inextricable and unprecedented. In reality, the world is functioning as a single organism with all the consequent benefits and potential dangers. The problem lies in the fact that many dangers that were formerly localized now have the effect of endangering the entire organism very quickly. An example of this, is the spread of viruses such as Ebola and SARS that create the risk of pandemics that can threaten the entire world. Another example is that of Syria where what started off as protests clamoring for political change, evolved into civil war, the rise of insurgencies and the illegal use of chemical weapons. Syria's domestic problems eventually spawned three world-encircling crises: the flow of economic migrants and refugees to Europe and beyond, the creation of fertile soil for terrorist networks to flourish, notably ISIL, and the widening of the scope of the conflict with different countries such as the United States, Turkey and Russia arrayed on different sides of the internal conflict leading some to describe the war in Syria as a "proto-world war". Yet, in the face of these growing global challenges and systemic risks to the international order, our systems of global governance have lagged far behind in their evolution and to the extent they exist, have demonstrated a remarkable incapacity to evolve in ways that can meet these challenges. Our modus operandi as a world community has been to wait until a crisis has wreaked a great deal of suffering and havoc or until the eleventh hour, before we begin to act: witness the laggardly pace at which we have responded to the siren calls warning us of the disasters that lie in wait as a result of unmitigated climate change. Our national leaders and international institutions have proven themselves unequal to the responsibility of being proactive and of cooperating and collaborating to manage common problems. To quote a former president of the UN Security Council: "The demand for global leadership has never been greater....the world has changed structurally, yet our systems for managing global affairs have not adapted" and so, he concludes: "Our world is adrift". Many believe or assume that the United Nations can and will stem the tide of these global challenges and provide the global solutions we so urgently need. This, however, is a mistaken belief. The truth is that the the UN was created in a different era and was not equipped with the power, authority, legitimacy or tools it needs to properly address severe global challenges on the order of climate change, global financial crises, pandemics, terrorism, migration, genocide or the proliferation of nuclear weapons to name but a handful of the most severe crises of our times. As time passed, unfortunately, it failed to evolve as rapidly and drastically as was necessary to meet these challenges. Consequently, it stands in danger of becoming obsolete. Firstly, the UN General Assembly, though providing a wonderful forum for representatives of nation states to gather on a regular basis to consult upon and discuss global affairs, suffers from two obvious defects: firstly, its members are not truly representative of the peoples of the world, in that they are not directly elected by them as members of a national parliament or legislature would be. The institution therefore does not have the legitimacy it requires when it passes resolutions urging action in a particular sphere of activity. Secondly, the UN General Assembly does not have the power to pass legislation that is legally binding on all its member states. Consequently at a time in our collective history when we most need a viable collective decision-making body which can effectively address collective challenges, we find ourselves lacking. For example, we need a world decision-making body (i.e. a world parliament) that properly represents the people of the world to determine what kinds of energy we can use to arrest global warming with its potentially disastrous consequences and to be the trustee for natural resources that are part of the common heritage of humanity, while regulating the production and ensuring the equitable distribution of such resources. We also need a collective decision-making institution that can pass binding regulations in the financial arena that ensure that we will never again suffer from a global financial crisis that threatens the well-being of our planet. Moreover, we need a world parliament that has the authority to levy taxes from individuals and corporations that would fund its critical activities that are in the global collective interest. Such a fund might be used to help bail out countries in financial distress (like Greece), that would support research and development to find alternative clean sources of energy or that would fund the research and development of vaccines to prevent the spread of virulent pathogens that threaten the health of our global society. Such a world parliament would also need to have the capacity to enforce its rules through an international executive that does not suffer from the fatal flaws of our current UN Security Council which brings us to the point that the Security Council is not truly representative of the nations of the world. It is also hamstrung by the fact that its five permanent members have the right to veto a decision in support of restoring or maintaining peace even if all the other nations believe it is a good decision. Moreover, the Security Council's mandate is vague and needs to be properly fleshed out so that it can act swiftly and with confidence knowing that it will not be accused of overstepping its authority. Finally, the Security Council lacks some critical tools it needs to accomplish its mission of maintaining peace in the world. For example, it lacks an international intelligence agency from which it can obtain timely, reliable, shared and transparent information on the basis of which it can make decisions to take action. It also lacks an international police force serving at its behest to take timely, efficient and effective action to nip problems in the bud before they fester into unwieldy disasters. To effectively counter our current global challenges we need to have an international executive that would serve in accordance with a universally-agreed-upon mandate and pre-determined rules arrived at by consensus of all nations. It would have at its command an international police force that would be comprised of units from all the nations of the world. In short, it would act only collectively at the behest of the democratically legitimate parliament in accordance with collectively determined rules and through collective mechanisms. Finally, the United Nations today lacks the ability to forestall many global conflicts because the World Court which is one of its agencies lacks compulsory jurisdiction to require nations that are in dispute to come before it so it can hear and decide these cases before they spill over into conflict that destabilizing peace. It is untenable that at this moment in history when there is so much at stake, and local conflicts can so easily cascade into international conflicts that with potentially horrific consequences, including the use of nuclear weapons, that nations are not compelled to appear before a World Court to have their disputes decided peacefully. Not only does the World Court lack compulsory jurisdiction, it also lacks the ability to enforce its decisions and essentially relies on the honor system for states to comply with its rulings. We would never countenance a national judicial system in which a murderer was either given the option to show up in court to be tried or to opt out of a trial (i.e. no compulsory jurisdiction), or in which such a murderer once found guilty was asked to go and lock himself in a gaol cell and remain there for the duration of his punishment. And yet, despite the fact that our world is now so interconnected and interdependent, we continue to put up with this manifestly ridiculous system that is not serving us well. It is high time that we create an international court with both the power of compulsory jurisdiction to hear cases that could lead to international disputes and the means of enforcing its decisions, through the agency of an international police force. Ultimately the larger lesson here is that if global institutions, such as the UN, or policies or procedures are no longer serving the welfare of humanity as a whole and if our systems of global governance are lagging far behind the movement towards global integration and interdependence, then we must be willing either to radically reform them or to create new alternatives that will ensure our peace, security and well-being. We owe this to ourselves and to future generations. We live in a world that is interconnected and interdependent in ways that it has never been before. Human beings are moving from country to country in unprecedented numbers, both voluntarily thanks to the explosion in affordable means of travel and as refugees fleeing persecution, or economic migrants seeking a better life. Advances in communications technology have made it possible to communicate instantaneously from from one end of the globe to the other. Although these advances have enriched our lives in many ways, they have also made it possible for those animated by hate, prejudice, or unalloyed lust for power and glory to wreak havoc and destroy lives more easily. Terrorist networks benefit from access to encrypted communications technology and freedom of movement to kill, maim, destroy and spread terror. Despite the tremendous advances we have made in turning our world into a global village, one in which we are inextricably interconnected through global trade, communications, finance and travel, we are lagging behind in the creation of critical collective institutions that are necessary to serve our growing collective interests. The events of the past few year have increasingly pointed to the need for an international intelligence agency that would serve the collective interests of the international community by providing accurate, timely, reliable and shared intelligence. Questions such as whether Iraq still had a secret nuclear weapons program and a cache of weapons of mass destruction in the lead-up to the 2003 Iraq war, whether Iran was and is in fact trying to build a nuclear weapon, or the true extent of North Korea's nuclear activities, are all ones that could most effectively and reliably be answered if the world had such an agency. The lack of such an agency serving humanity's collective need for security was palpably felt in Paris last weekend when the city and many innocent people in it became the target of six simultaneous terrorist attacks that by all accounts had been meticulously planned over a period of time. It is not too late: world leaders should now bend their efforts to creating a formalized, supranational intelligence system that integrates national intelligence capabilities and is responsible for gathering credible and timely intelligence for a reformed Security Council that is more representative of the people and nations of the world and whose mandate to preserve peace and security has been fleshed out and made more clear. The existence of such a system would make it much harder for those intent on committing heinous acts that instill terror into the hearts of people to carry on their activities undetected. Moreover, the fact that such intelligence is shared, means that it is more likely to be trusted by the countries which it impacts, making it more likely that they would feel comfortable relying and acting upon it and doing so more swiftly and decisively. It would also lead to greater unity in decisions made by the Security Council, which is, after all, the international agency tasked with maintaining peace in the world. Europe can lead the way by creating a European-wide regional intelligence agency. In the aftermath of last weekend's attacks in Paris the question that is being asked in some quarters is whether Europe's informal system of sharing intelligence is adequate to deal with the threats it is facing. There is a call in some quarters for "some form of institutionalized sharing of electronic and human intelligence." Such action could serve as a first step along the road towards the creation of an international intelligence agency. It could serve as a testing ground from which we could all learn how we might to do this successfully at a global level. One valuable lesson such a step will hopefully model is that it is possible to get nations to trust each other enough to be willing to share intelligence in a systematic and timely manner. An even deeper lesson will likely be that ultimately such trust will come only when the nations involved are convinced and deeply understand that ceding a modicum of sovereignty by sharing intelligence is in their own best interests and will benefit them both individually and collectively in the face of collective threats like terrorism. This was the fundamental and powerful lesson and operating principle upon which the foundations of what we now know as the European Union were based. Over the past five years, the world has been gripped in the suspense of an unfolding drama: that of the Greek sovereign debt crisis. As the drama has moved towards its climax in the last few months, with Greece and the euro zone countries lurching from one nail-biting scene to another, the world has continued to watch and wait with bated breath, wondering what the ultimate outcome will be and worrying about its potential ramifications for the financial markets in Europe and beyond. Despite the repeated injection of funds by Greece's creditors, namely the IMF, the ECB and the euro zone countries, Greece's plight remains dire: the country has lost 25 percent of its GDP over the past five years, the general unemployment rate is over 25 percent and double that i.e. 50 percent among the youth. The country has strained and groaned under the imposition of austerity measures imposed by its creditors. In the end, on June 26, her elected leaders chose to walk away from negotiations with creditors aimed at providing further bail-out funds in return for further austerity. There followed a referendum in which the majority of Greek voters rejected bail-out terms offered by those creditors. The European Union now finds itself in an unprecedented situation in which one of its members may default on a $3.9 billion in bond payments to the ECB on July 20th, having already earned the dubious distinction of being the first developed country to default on a loan from the IMF. If the July 20 payment is missed, the ECB will likely cease propping up the Greek banks with emergency loans, Greece will plunge into bankruptcy and will have to start paying its bills in IOUs, all of which will probably lead it to exit from the euro. What the effect of such an exit will be on the financial markets in Europe and beyond and consequently on the global economy, is anyone's guess. One of the problems with a Greek exit from the euro zone (commonly termed a "Grexit"), is that the monetary union was set up as a "no exit" union, meaning there are no legal avenues for those who have joined to leave it, and yet, as a practical matter, unless Greece and her creditors can come to terms before July 20, such an exit is likely to become a reality. Even if this happens, however, there is nothing to stop Greece from staying in the EU although this relationship could rapidly become complicated if Greece finds herself unable or unwilling to follow the rules of the single market. In the end, there is a chance that Greece may end up leaving the European Union. Such a departure would set a terrible and unfortunate precedent for a Union that was committed to increasing its integration. As the Economist points out "the long-term effect of an irrevocable union being partially revoked is unpredictable." What then, if anything, can be done to save the European Union from unraveling? The answer may well lie in further integration and closer unity within the European Union. Indeed, the American experience teaches us that further integration can be critical to solving Europe's financial crisis. Most of us forget that American began life as a fiscal mess and that one of the main drivers for moving from a loose confederacy to a tighter federation was precisely the problem of the large debts that the thirteen American states had taken on during the revolutionary war and were finding themselves unable to repay. During the war each state had separately borrowed heavily from foreign powers. After the war, the states found themselves unable to repay what had become enormous debts. The Confederation was hamstrung and unable to help, because it lacked the power to impose taxes and most states were not paying their share of assessments to the confederate government -- a condition that is familiar in the context of the European Union today. Within the context of the American experience, the problem was further exacerbated because the states were printing their own money at will. The flood of paper money produced wild inflation in American economies. The only solution was to move towards greater unity and integration by creating a federation with a central government capable of levying federal taxes that it could use to repay the foreign debts, or else risk disintegration. The parallels with the EU's current dilemma are striking! One of the problems the European Union currently faces is the resistance by its member states to mutualizing liabilities, especially in the absence of mutualized responsibility, for example by being able to raise European-wide taxes to fund bail-outs or the ability to have shared decision-making over budgets, taxes and pensions in the first place. As eminent economics experts have said, the crisis in Europe is at root a deep constitutional and institutional one rather than one of funding. The real solution appears to lie in Europeans taking a quantum step toward deeper economic and political union which requires an acceptance that its member states must be willing to cede more sovereignty. The insistence by EU countries on clinging excessively to sovereignty in the face of the suffering and chaos it is causing them individually and collectively, is not sensible. Surely, policies and theories of how we organize ourselves as peoples and nations are there to serve our best interests and to lead to our well-being. If they have ceased to do so and are patently injuring us, is it not time to reconsider and adjust them? In this instance, giving up a modicum of sovereignty in accordance with clear rules, backed by collectively-created and shared enforcement mechanisms and agreeing upon sanctions for non-compliance that are applied even-handedly to all member states, may well go a long way to relieving the European Union of its current suffering and the Greeks of their plight. While today it is the Greeks who suffer, who is to say that in the absence of necessary reforms to the system, tomorrow other European countries like Spain, Portugal, Ireland or even France may not follow in its wake? It was such a recognition that led the thirteen member states of the American confederation to take the momentous decision to fuse their interests by moving from a confederation to a federation, in which certain limited powers that affected their collective interests were delegated by them to a central government, while remaining powers were retained by the states themselves. The Europeans might do well to examine closely this historical precedent that has resulted in the creation of a strong, unified country that overcame its debt problems and consider following suit by applying the adopting the principles of federalism to the European Union. There is still time to use the Greek crisis as an opportunity or stepping stone, to create a watershed moment in the history of the European Union, one in which the obvious vulnerabilities of the common currency are recognized and addressed by taking swift, effective and unified steps to strengthen the EU by taking the next step towards creating a United States of Europe, as envisioned by Winston Churchill in the aftermath of the Second World War. HOT OFF THE PRESS -- January 1, 2015! Humanity has been passing through stages of collective growth towards integration and unity. Our current collective crises––climate change, financial upheavals, proliferation of nuclear weapons, gross human rights atrocities, mismanagement of critical natural resources––manifest our passage through a turbulent adolescence. Humanity should take the next step towards maturity by establishing collective decision-making institutions that can evolve into a world federation of nation-states. Only then will we have a truly peaceful world. If these topics are of interest to you, I invite you to read my new book the front cover of which appears above and recommend it to your friends, family and colleagues. Amazon.com (or Amazon in the UK, Germany and other countries) or at Barnes & Noble (BN.com), or at kobo.com. It will also be available on Apple iTunes as an iBook. The events that we have witnessed in the Ukraine over the past several months cry out for the global community of nations to rise to a new level of collective maturity and to agree upon a unified and robust response. World events keep providing us with opportunities to learn how to come together as a community of nations and agree upon some foundational principles that will guide us in our international relations and which we will refuse to compromise regardless of our perceived short-term interests, especially our economic interests. To allow any nation to provoke instability in another without consequence, especially if it leads to the death of innocent people as occurred when 298 passengers on board a Malaysian civilian airplane were killed when their plane was shot down over rebel-held territory of Ukraine, or to the illegal annexation of foreign territory as occurred when Russia annexed Crimea in the spring of this year, is to sow the seeds of international anarchy and lawlessness that bodes ill for the welfare of the global community. The fact that NATO has chosen to respond to these events and others that are tearing at the fabric of Ukrainian society -- such as the continued unrest in Ukraine caused by separatists apparently backed by Russia that are claiming independence for the cities of Luhansk and Donetsk -- while certainly a positive movement, is alas not sufficient. NATO's decision taken at its recent summit in Wales to create a Rapid Reaction Force consisting of 4.000 troops to safeguard the integrity of the Eastern European nations that border Russia, while a step in the right direction does not go far enough for a number of reasons. First, we must be wary about unwittingly slipping back into old patterns of international behavior that have not served us well in the past, namely a Cold War mentality in which the "West" is pitted against Russia. It is time to leave these old patterns of international relations behind and to work on a collective global solution to problems of this kind. Second, such half-measures are merely palliative and do not solve the underlying problems. Third, because the solution is not one based on the international community speaking with one voice, it does not have the desired effect of forcing the bully on the international playground to back down and to think twice about his behavior. The real question that we need to ask and answer as a global community is what should we do when any nation or terrorist network threatens the peace and stability of the international order? Such a threat can be brought about by a range of behaviors that include for instance territorial aggression, unlawful nuclear proliferation (such as have occurred in North Korea and Iran), genocide (e.g. in Rwanda and Kosovo), other forms of gross human rights abuses against a population (e.g. Syria) or terrorist activities. The answer must surely incorporate the following elements: it must be based on universal agreement of all nations; all nations must take ownership of the solution by contributing both financially and in the form of troops and equipment; it cannot take into account perceived short-term national interests such as the need for natural gas, or the desire to maintain a nation's status as a seller of international arms, both of which factors are apparently in play in the Ukrainian situation. The decision by NATO to create a Rapid Reaction Force for Eastern Europe is to be lauded for the fact that it demonstrates the will of the member states of NATO to look past the dictates of expediency. It further demonstrates that nations can be persuaded to do the right thing and look beyond their national self-interest to uphold higher international standards and that the nations are gradually demonstrating that there is a limit to the kinds of behavior they are willing to tolerate. However, it is time for the international community to take the next step and come to collective agreement upon the establishment of a Rapid Reaction Force that is international in nature rather than purely regional, one that is there to serve the needs of the international community as a whole and to preserve the peace regardless of where it is threatened or breached. Such a force would likely have regional components such as the one currently proposed by NATO for Eastern Europe but all of these regional components should be coordinated by and serve under the auspices of an international structure overseen by a central international institution (perhaps a much-improved and reformed Security Council) tasked with preserving the peace. Although there is much work to be done to identify and agree upon the principles and policies that can serve the collective security needs of today as well as to carefully build a new institutional framework capable of embodying these collectively agreed-upon principles, there is no time to begin like the present! The world cries out for new ideas to solve big problems like nuclear proliferation, climate change and ineffective international institutions . I hope to stimulate discussion by offering alternative analysis and possible solutions based on a principled approach. We need to stop reacting to crises based on short-term, narrow interests and start acting equitably and effectively, with an eye on long-term consequences and the needs of humanity as a whole. The All-Knowing Physician . . .